Barack Obama has made his very first important decision as President Elect today November 6, 2008. 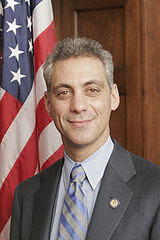 Emanuel was being considered and now has accepted an offer from President-elect Barack Obama to become the White House Chief of Staff in Obama's administration, which begins on January 20, 2009. He has been active in the U.S. House of Representatives since 2003, representing the 5th Congressional District of Illinois. When the Democrats took control of the House, he was elected chairman of the Democratic Caucus. He will be succeeding Josh Bolten. His religious belief is Judaism. So why did Obama choose him? In Barack Obama's own words, this is what he said... "I announce this appointment first because the chief of staff is central to the ability of a president and administration to accomplish an agenda," Obama said. "And no one I know is better at getting things done than Rahm Emanuel." Further appointments should be immediately forthcoming.. President-Elect Obama will be working closely with his team and also spend some time in a visit with President Bush as he and Michelle has been invited to the Whitehouse to meet the President and the First Lady Laura Bush.